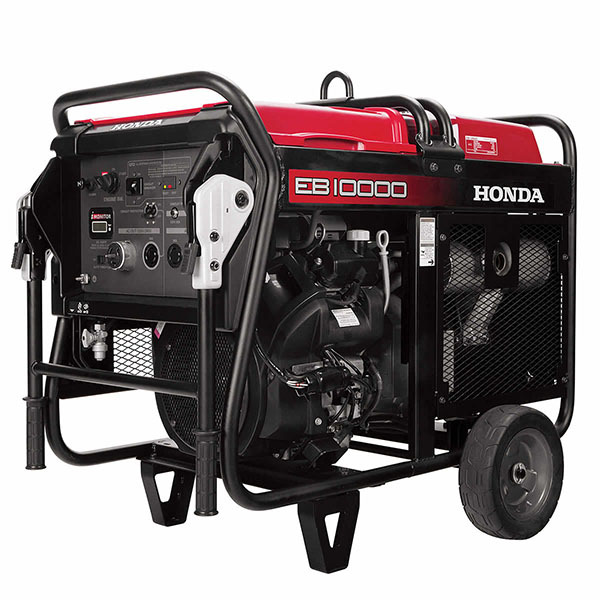 ADVANCED TECHNOLOGY FOR CONSISTENT POWER AND PERFORMANCE: The EB10000 uses Honda's exclusive DAVR (Digital Automatic Voltage Regulator). The DAVR is designed to hold the voltage stability within a +/- 1% range during operation. This provides more consistent power. 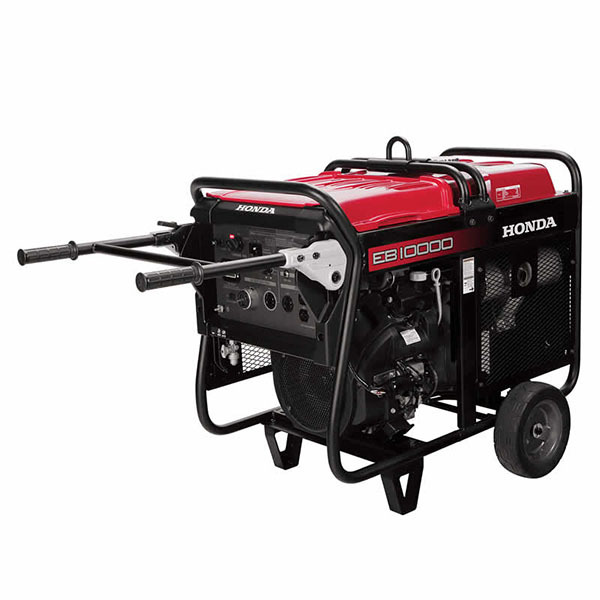 POWERFUL HONDA GX630 ENGINE: The Honda V-Twin engine offers more power, reliability, greater fuel economy and reduced emissions in a more compact package. 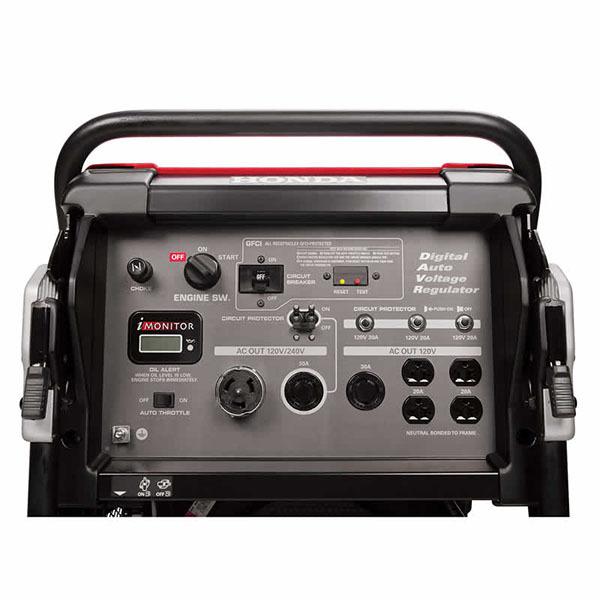 COMPACT SHAPE AND UNIQUE DESIGN FOR EASY INSTALLATIONS: The EB10000 has a compact, slim design that can be easily installed on the job site. A centralized exhaust mechanism creates a unique "hot" zone for exhaust and "cool" zone for operation and passage. This design is especially helpful when using multiple units, as they can be easily positioned so as not to impact each others' cooling ventilation. QUIETEST IN ITS CLASS! : The Honda EB10000 generator operates at an extremely quiet noise level – at approximately 76 decibels at 23 feet (equivalent to the noise of a vacuum cleaner). This low noise level is achieved through a large muffler that includes a punching pipe, a perforated mechanism that allows for the smooth release of exhaust gas. 7 OUTLETS FOR EASY CONNECTION OF MULTIPLE TOOLS: The control panel is positioned on the narrow side of the generator for convenient, easy access to all outlets. i-MONITOR LCD READOUT FOR PERFORMANCE MONITORING AND SERVICE DIAGNOSIS: i-Monitor™ provides information on hours of operation, generator output voltage, and battery voltage, as well as diagnostics for convenient dealer servicing. TWO WHEEL KIT FOR EASY TRANSPORTING: The sturdy wheel kit makes the EB10000 easier to transport, even over rough terrain. ALL CIRCUITS GFCI PROTECTED: The EB10000 offers neutral bond and full generator GFCI (Ground fault circuit protection) on all outlets. 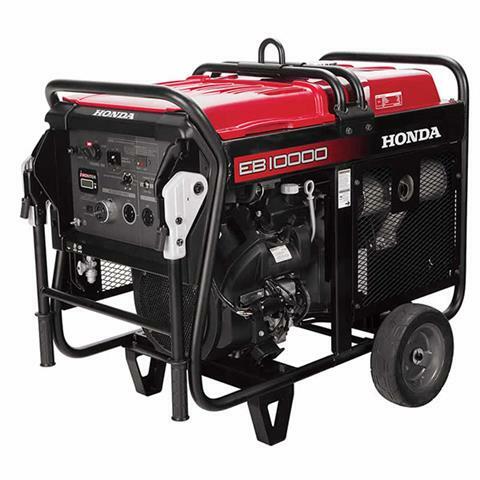 OSHA WORKSITE COMPLIANT: The EB10000 was designed to meet OSHA requirements, making it ideal for worksite applications. DESIGNED FOR EASY MAINTENANCE: The EB10000 is designed with an easy-to-remove air cleaner and an oil gauge located near the oil filler cap - all elements that allow for ease of maintenance. 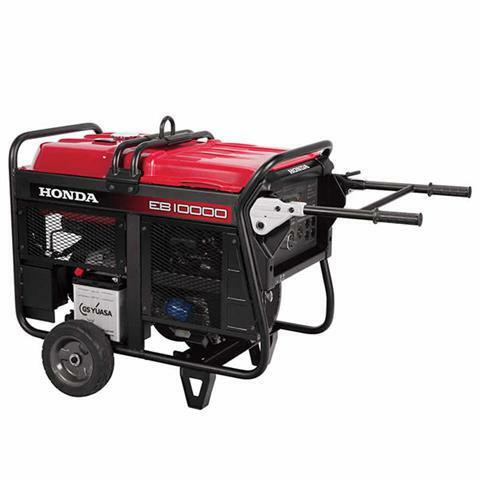 ONE-TOUCH, REMOVABLE PLASTIC TOP COVER: Allows for easy battery access and maintenance.